The most common physical hazards livestock handlers are exposed to include kicks, crushes, falls, abrasions and punctures. These hazards can be controlled by good facility maintenance, training and use of personal protective equipment. Use of safety footwear, leather gloves and close fitting clothing is important. Cattle have close to 360 degree panoramic vision. Farm animals see things in black and white, not in colour. They have difficulty judging distance. Animals can detect sound that our ears cannot hear. High frequency sound actually hurt their ears. Animals can never be taken for granted; you can never be absolutely sure of how they will react. An appreciation of animals' characteristics is crucial to working safely with livestock. These should be considered when designing livestock facilities. Poor facilities and equipment can cause injuries to animals and man. Prior to construction or renovation of livestock facility, considerable planning should be done. Animal characteristics should be considered along with possible expansion in the design of a facility. Wide enough for free passage of the animal but not wide enough for the animal to turn around in. Catwalks on the outside of the alley or chute so you do not have to enter the alleyway or hang over the edge. Solid walls on chutes and turns in the alley to reduce chances of the animal being frightened from the outside. Floors should be designed to guard against slipping yet easily kept clean. Strong enough to withstand animal crowding. Free of any sharp projections such as nails or wire. Concrete or other impervious materials. Slip proof (grooved in passageways). Avoid having animals look directly into the sun. Animals move easier from dark to light areas. Lighting may affect productivity of some animals. Restraining chutes should be free of any obstructions that could hurt the animal. The handler should have free access to any part of the animal without having to reach over or through the chute. All restraining equipment should be checked regularly for wear or damage. Portable handling equipment should be securely anchored before use. Do not tease or provoke. Avoid loud shouts or noises that could startle an animal. Don’t enter a pen where you don’t have a quick exit. Mothers are protective; don’t come between them and their offspring. Match your handling skill to the temperament and size of the animal. Respect livestock; don’t fear them. Be calm and deliberate; most animals respond to routine. Avoid quick movements or loud noises; announce your presence well in advance of getting close to an animal to avoid startling it. 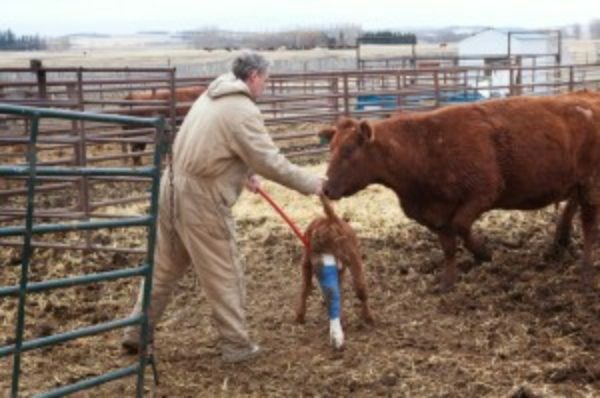 The most common physical hazards livestock handlers are exposed to include kicks, crushes, slips, falls, abrasions and punctures. These hazards can be controlled by good facility maintenance, training and use of personal protective equipment. Use of safety footwear with appropriate soles, leather gloves and clothing that is not overly loose which could get easily snagged is important.